You believe me when I took up the test, I used the previous year book and I was given a choice of either take up the current year manual they provided just then there or take it up next time; They would not allow me to use the previous year's. It is a rule .They have to abide. I was not aware of it. I started packing off from the exam hall. But by a wink of an eye, the proctor just signaled 'Just wait'. She was so graceful enough to call our Board to just get the final say. There she came up with the green signal to allow me. I praised Lord. I thank our AAPC Board immensely for allowing me. You know what. My first prayer was ''Lord this is your battle and you triumph and all glory belongs to you''; then started the real battle and the devil was trying to put me to shame but our Lord reined. I finished the exam just in exact time not even a fraction of second extra and all questions answered and I came out with good colors. All glory be to Him. I did all things through Him who strengthened me. I really needed to hear this. I asked Him to give me a sign that all will be well. Your reply was it. I am putting all my trust in our Lord that it be HIS will and not mine. He knows my heart better than anyone else. I sure can't do this alone. I like coding at my job. At times it is hectic(? ), but I learn everyday. I am hoping for the best tomorrow. Thank you so kindly for your response. I do need prayers and guidance from our Lord Jesus Christ. I am prepared to win this battle and gain victory through our Lord. jumped around, then did the Med Term, HCPCS, then back to coding. never want to do this again!!! : This was my 3 rd test. I got 50, 64, & 66. I pray I passed. Last edited by BJanePla; 12-10-2010 at 08:21 PM. This was NOT an easy exam. I took mine last Sat. and am waiting for results...I took a 'crash course' with people who were already aworking in the field.. I have a very strong medical background and it was a good thing! I am in contact with a friend I met while in this class and she is on pins and needles also waiting. I am taking the exam this Saturday, and reading your posts worries me. I am wondering how many of you have prior coding experience, and how much? I have been coding on and off for 25 years, just started studying for the exam a few months ago. I've really been grinding it out the past few weeks. I have a problem with testing, can't focus, so really working on that. Am able to score in the 70's-80's on the practice tests, have taken all 3 multiple times. Now am trying to focus on the questions I am missing, and what I am overlooking. Most of the time I wasn't paying attention! Any more advice would help me! Thanks! So color me confused in Syracuse. Don't give yourself a headache over how many you can and can not miss. Don't just study to get 1 or 2 more correct. . . study like you plan to get every question correct! Otherwise, you will sit there worrying about getting one or two more questions right, rather than focusing on the task at hand. You know you came close the 1st time, now just focus on practicing/studying and you'll definitely improve. Took my exam on the 19th, for the 3rd time studied for weeks, posted material, only to find that I had failed again with a 68. This really suxs. Had gone though the test leaving the harder question for last. thought I did really well. Almost couldn't take the test , because aapc membership had expired after paying for test. Then HAD TO PAY FOR MEMBERSHIP TO GET THE FAILING RESULTS. I really think if you pay 300.00 for a test you shouldn't have to pay for a membership to GET THE RESULTS! Money hungry rip off, not the test. That was 125.00 in grocery money I could have use for the month. Don't miss understand me I 'm all for paying for the test, I just think having to pay for results in this tight time uncalled for. Last edited by Milanmarino; 03-31-2011 at 12:20 PM. Reason: Content not correct. You think it's hard passing the exam now? You should have tried taking it a few years ago. They've actually made passing the exam easier for you guys. When I took my test, the test was split into "sections" and you had to pass each section or you FAILED. Meaning, you had to be equally as good in ALL portions of the test, or you were royally screwed. This test is hard, I know. I took it more than once and each time, after I was done with the test, I left feeling like "WTF JUST HAPPENED IN THERE?!" I had to take it 3 times. It was awful. I knew that I could code. I got hired before I got my certification, and had 90 days to get certified or get out. I had already proven that I knew my stuff (to my employer). I couldn't understand why I was having trouble passing the test, aside from the time issue. I felt so rushed. You feel completely blindsided afterwards. My advice is not to obsess over any one question. If you're really having that much trouble, mark it and skip it so you can come back to it later. Try to relax and stay optimisstic! Keep studying and keep trying. The test, the studying, and the fees have ALL been worth it, for me. I no longer have a job. I have a CAREER, one that I am proud to claim. Good luck to those of you that are still working on that certification! You'll get it, I've got faith in you. ohn0disaster - I have to comment - it really frustrates me when people say the test is easier now. (or easier "back then") whatever they say, because I've seen it stated both ways..... seriously...? really? 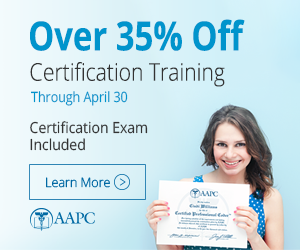 you make it sound as though AAPC has lowered their standards, making tests easier to pass now...really?... I took my CPC test years ago - it was very difficult, but I passed, and it was worth it - I took my CPC-H a few years back - guess what... it WASN'T easy! It was just as difficult ....BUT, I passed that too.